Photographs, posters, and portraits: Pin ups have inspired many art forms. The only thing more famous than pin up designs are the models who posed for them. Burlesque dancers were the first ones to start pin up modeling. Then came along Rosie The Riveter – a cultural icon of World War II. This legendary poster is perhaps the most recognizable symbol of feminism and pin up culture. 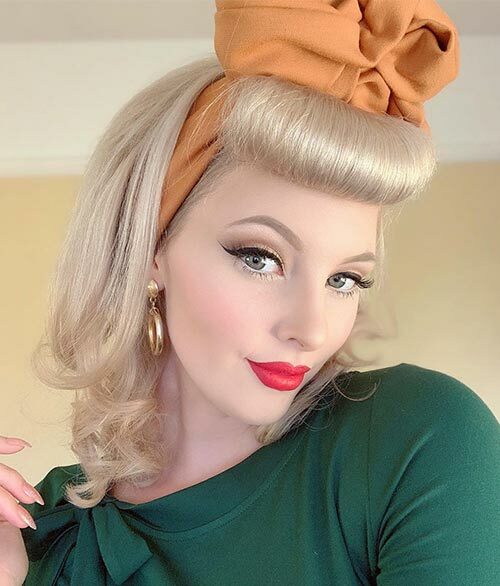 If there’s one thing that pin up models have given, it has to be their epic hairstyles – from pinned curly bangs to red carpet-worthy waves. 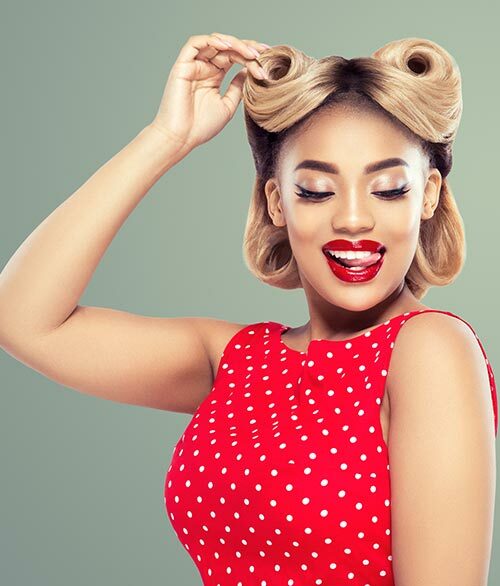 We’ve compiled 32 fashionable pin up hairstyles to amp up your hair game. Scroll down to check them out! This is a classic ‘50s must-try hairstyle. If you check out pin ups from that time, you’ll see this victory roll in many of them. Add some strong-hold mousse to the hair in the front. Style it in a roll with the help of a blow dryer and a round brush. Pin it and spritz on lots of hairspray to secure it in place. Two is better than one! Double victory rolls were worn with either a low bun or loose hair. It was a big style statement. Pair this hairstyle with a polka dotted dress, and your pin up look is complete! Don’t confuse side rolls with victory rolls. Notice how the deep side-swept bangs lead into the side rolls. Apply gel to your bangs and part them on one side. With the help of a blow dryer and a round brush, add a slight wave to the top of the swept bangs. Divide the ends of the bangs into three sections. Curl the ends of each section in delicate rolls and pin them in place. High rise rolls look very classy and elegant. They are perfect for any formal red carpet event. They are styled the same way as victory rolls, except you need to lift them first to create the high rise effect. Very beautiful! Yes, messy curls were big back in the day as well! The key to perfecting this hairstyle is to add volume at the top and keep the curls big at the end. You can add volume by backcombing the hair at the top. It will also add to the messy look. 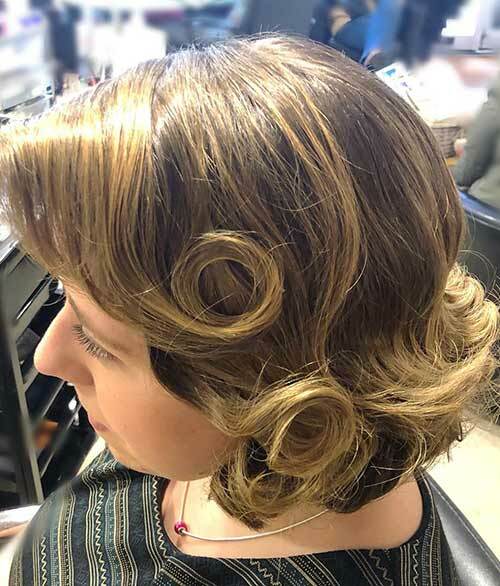 Victory rolls have been paired with Hollywood curls in this glamorous hairstyle. This was the IT style of the ‘50s and continues to be stylish. It is also sported by celebrities at many award functions. Before these curls were referred to as Hollywood curls, they were known as pin up curls. 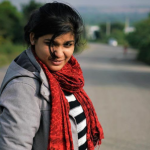 Girls sported them with flared vintage skirts and off-shoulder tops. Finish off this look with a colorful scarf to look like a diva! Rosie The Riveter is a symbol of women’s empowerment even now. So, it comes as no surprise that this hairstyle is still sported by women all over the world. It portrays strength, power, and equality! Bumper bangs were big in the ‘50s. They require the bangs to be folded up to mimic a bumper look. This was the edgiest look of that time. You can sport a victory roll even on short hair. You need hair gel, a round brush, and a blowdryer to do this hairstyle. Apply gel all over your locks. 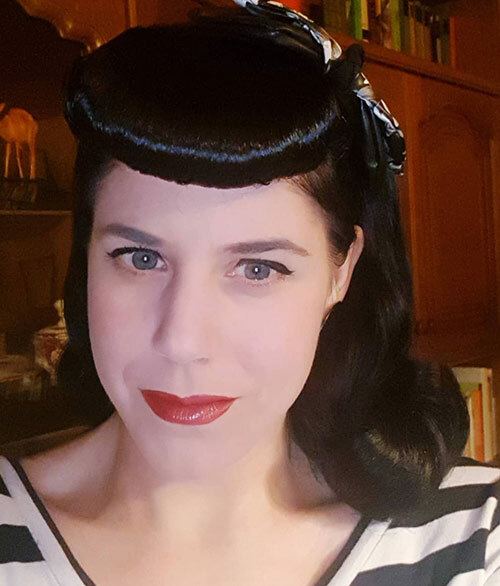 Comb your hair upwards and style it in victory rolls. Blow dry and pin them in place. Clearly, rolls were big back in the day. I’m sure if you scan through a hundred pin ups, most of them will be sporting some form of rolled hair. With some gel, a round brush, and a blow dryer, you too can achieve this look. Don’t forget to curl the ends of your hair! Rolls and curls can add a lot of oomph to your hair. They make your hair look stylish while adding volume. Style your hair at the top in a victory curl and curl only the ends of your locks. Pair it this look with a nice vintage dress, and you are good to go! More often than not, you’ll see girls wearing colorful headbands in pin ups. Back in the day, headbands were all the rage. They were paired with dresses, jumpsuits, and swimsuits. No one knew the power of deep-swept bangs more than pin up models. Deep side-swept bangs can really jazz up a simple hairstyle and turn up the heat. To accentuate the bangs even more, lift them up at the front and hairspray them in place. High bumper bangs look very cool and vintage. To create the perfect bumper bangs, use a hair product called a hair rat. It’s bendable and will give you that perfect bumper shape. You can buy a hair rat from any beauty supply store. Side-swept hair looks stunning. All you have to do is sweep your hair to the side and hold in place with hair pins. 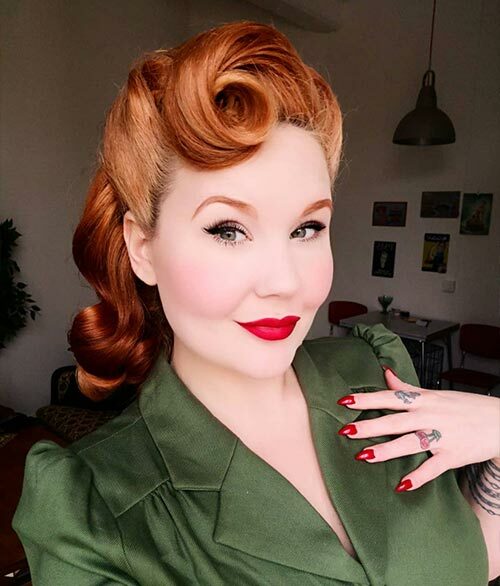 To make this style really pin up-worthy, add some victory rolls at the top. Curl your hair and spritz on hairspray to keep it in place. Pin the individual curls to your head to form the curly top updo. Pair it with some light makeup and bright red lips and go slay! The beehive is uber stylish even now. It’s a very suave hairstyle. Pair it with a head wrap or a scarf to create a vintage yet youthful look. Go for bright colored scarves to give this look a zesty vibe. Curls are a woman’s best friend. They can make dull hair look lively and add texture to your locks. But not all women want super big ringlet curls. 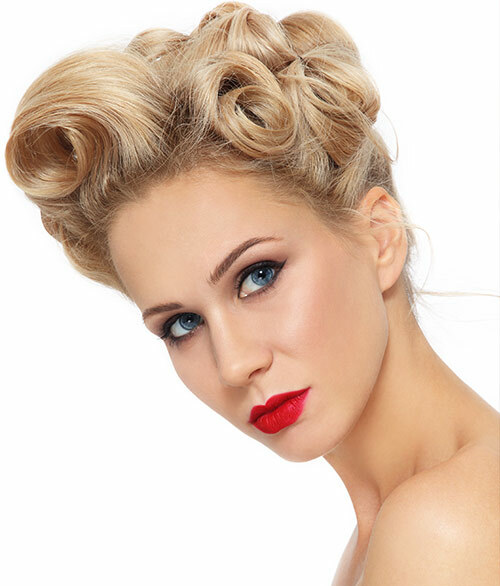 These modern pin up curls are a suave and classy take on curly hair. Never underestimate the power of bangs, no matter how small they are. Bangs can tweak your hairstyle and jazz it up. They help in framing your face as well. They also make you look younger and full of life. Marilyn Monroe was the woman that all men wanted and all women envied. Her curly blonde locks are nothing short of iconic. You’ll see many pin up models posing with Monroe hair. 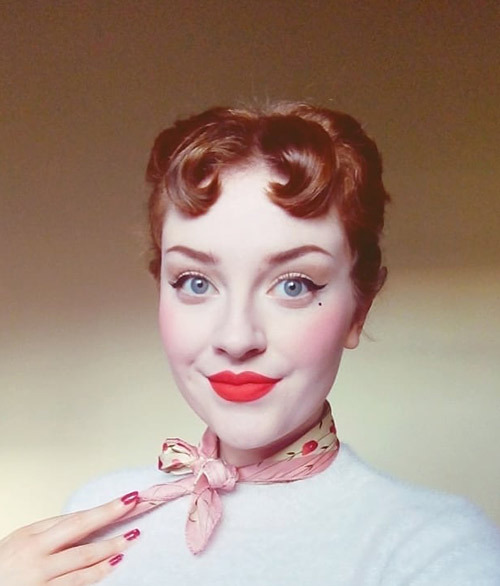 Poodle hair has to be one of the most classic pin up hairstyles. It consists of all your hair rolled up and pinned at the front. Accessorize it with a bright scarf and put on some red lipstick to finish off this look. Combining victory rolls and side rolls creates a great updo. You can try this look even if you have short hair. Simply pin up your hair in rolls all over your head. If you have long hair, you can tie your hair in a bun at the back. Big rolls were a big trend back in the day. Models posed with some crazy hairstyles, just like the one you see in this image. These kind of hairstyles are perfect for big events and photoshoots. But if you have the personality, you can pull them off any time. Mermaid hair is every woman’s dream. 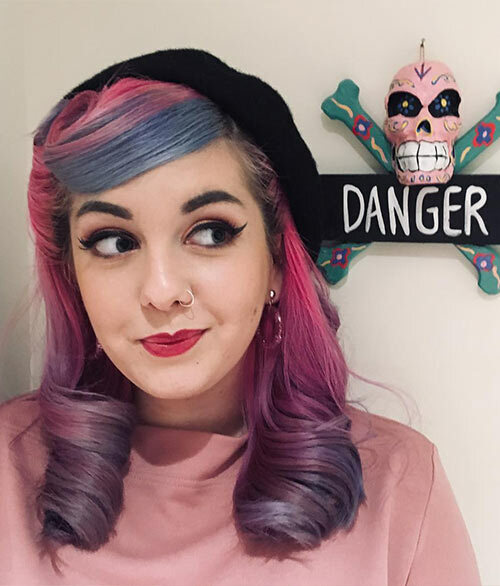 The classic pin up curls-at-the-end hairdo with some blue/pink mermaid colors makes for a great look. The colors bring the curls to life while adding a modern twist to the locks. Kudos to whoever decided to put a feather in their hair and make it a trend. The feather is one of the most sophisticated hair accessories. Pair it with perfect curls, and you’ve got a killer look. We’ve all heard our parents tell us how the old trends are coming back in fashion. While they’re certainly right, we’ve also added our own spin to them. Case in point, this back roll and high bun. Very sleek! Rockabilly hair is inspired by rock ‘n roll music. It is a pompadour hairstyle. Many famous women, like Betty Davis, sported this kind of hairstyle. Here, instead of a heavy pompadour, the model has opted for a subtle pouf with baby side bangs. This is the classic fashion model look. The bouffant is a big hairstyle trendsetter. Pair it with a big bow or a hairband, and you’ll be the poster child for vintage photoshoots. The pin up bob was inspired from the flapper cut. In a time when women were expected to have perfect long hair, wear floofy dresses, and wait on their breadwinning husbands, a few women went the other way. They cut their hair short, wore short dresses, and earned their own living. And this was the hairstyle they sported! 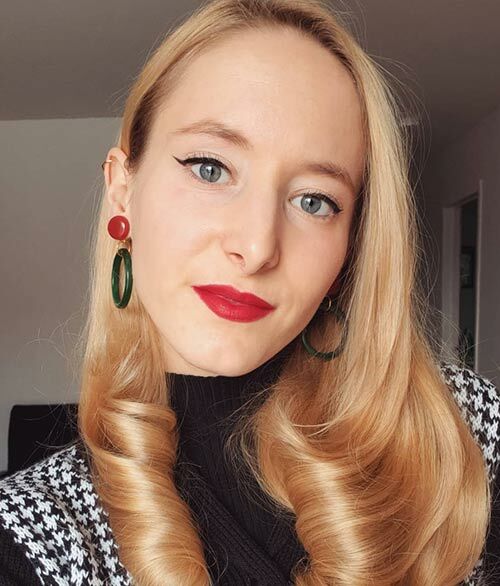 Retro style pin up curls are still very trendy. They are the perfect blend of old world and new world charm. Pair them with a bright red lipstick to finish off the pin up look. The barrette is one of the best pin up accessories. A beautifully designed barette can take your pin up hairstyle to the next level. Style it with a subtle victory roll and a classy dress to catch everyone’s eye! Those were my top 32 picks for the best pin up hairstyles. Though pin ups started out as a way of objectifying women, they became feminist symbols eventually. Pin ups like New Woman and Rosie The Riveter showed how modern and independent women are. 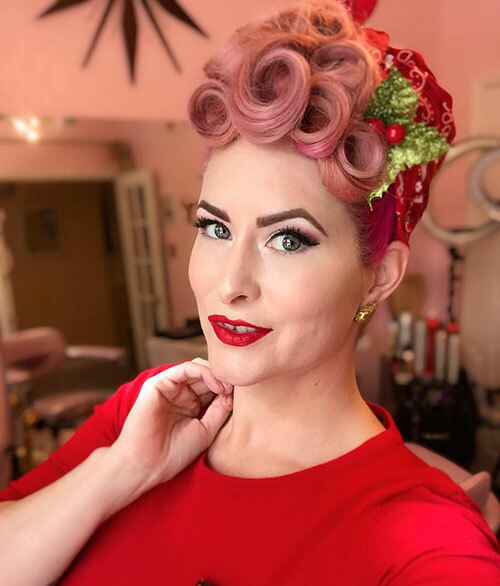 Which one of these is your favorite pin up hairstyle? Comment below to let us know!